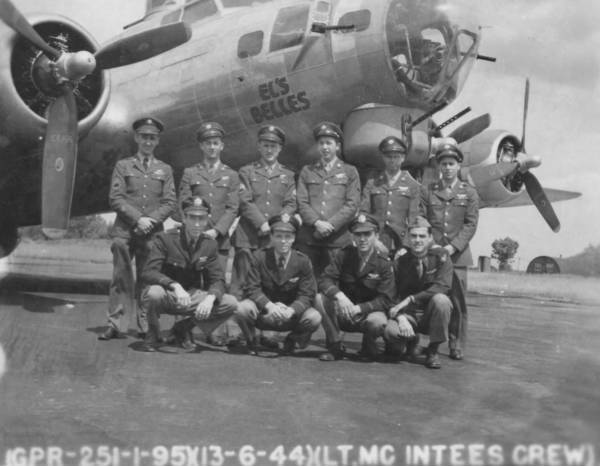 Delivered Cheyenne 4/3/44; Kearney 22/3/44; Dow Fd 4/4/44; Assigned 334BS/95BG [BG-A] Horham 6/4/44; with L.J. Price, force landed 4/8/44 sal; with M.S. Roy force landed Framlingham AFB 25/12/44; with H. Rivet force landed France 20/2/45; with J.E. Galbraith force landed RAF Ludham UK 21/3/45, sal; 106m, Returned to the USA Bradley 21/6/45; 4168 Base Unit, South Plains, Texas 23/6/45; Reconstruction Finance Corporation (sold for scrap metal in USA) Kingman 25/11/45. EL’S BELLES.